I was referred to Allison in early 2016 by Yingst Homes Inc. when searching for an Architect in our area for a commercial remodel project. From the onset, Allison was extremely professional and worked well with my client and their request. Unfortunately, my client chose to purchase a different property that didn't require Allison's expertise. Her response was professional and understanding of my client. Would highly recommend Allison and her company for your residential or commercial needs. Allison was AMAZING to work with. She was receptive of our goals/ideas, responsive to our requests, innovative with her design, and her final product was above and beyond our expectations. We met on November 19,2018 and had a full concept plan with elevations within in month! I highly recommend Allison and her team! Our project consisted of renovating a portion of the house built in 1949, removing walls, adding a kitchenette area and a full bathroom. 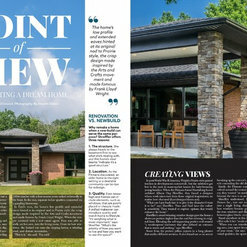 We had an eclectic idea of melding the original asthetics with a classic modern appeal. Allison did an incredible job of listening and putting together our sense of style while maintaining a practical methodical and budget conscience approach. We could not be more pleased we the results and would highly recommend for any project. 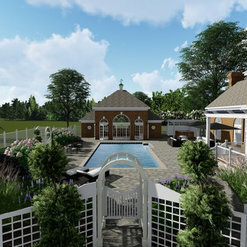 Allison and Becky did my renderings and couldn’t be more pleased with the outcome! They’ve made my job easier and love their ideas, quality and customer service with fast efficiency. 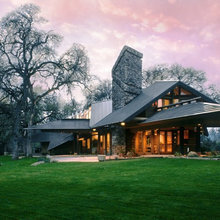 I would recommend Allison to anyone looking for an architect or designer! A great experience! Thank you for your kind words Paula! 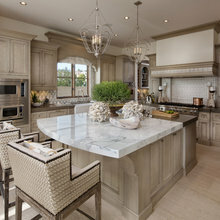 It was such a pleasure working with you and helping you to visualize your new home! It is always a pleasure to work with professionals! We have worked along side Allison and we make a great team! She has beautiful designs and together we have extremely happy clients! 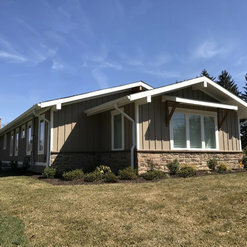 We used Allison for our home renovation and rebuild project to complete turn-key architecture and design services. 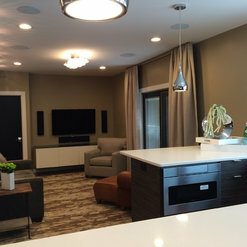 Allison provided us with best-in-class service in design and development of our dream home! We would highly recommend Allison for anyone interested in architectural and design services. Thank you for your kind words, Jeff! It was such a pleasure to work with you and Anne. 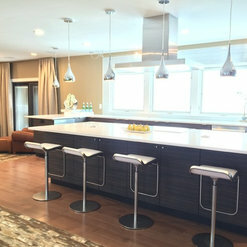 We are really enjoying watching the transformation of your home! Allison helped us turn our dated backyard into an oasis. She came to the rescue with her artistic and architectural sense and showed us what was possible. She patiently drew sketches, explained drawings, discussed space, and even expertly worked with us to get a variance for our amazing entertainment structure that we cherish and enjoy every chance we get. We will definitely return to Allison for our next big home improvement project. Thank you for your kind words, Jane! It was such a pleasure working with you and Jim! We are so thrilled that you love the result and that you and your family are enjoying it as well! I contacted Allison earlier this year, with a very important renovation dream, of moving three disabled family members into my home for optimal loving care. An old fashioned idea, of having multiple generations under one roof, family all together, helping to achieve one goal of health and happiness. I had the dream, and Allison had the vision, ingenuity, and creativity, and came up with a design that was beyond my wildest dreams. Every detail of the design, was drafted with each of my family member's disabilities in mind. She is a professional who is passionate about her work, and she embodies all of the strengths that one could wish for, including intellect, compassion, and attention to every detail. She was always accessible for questions, updates, and budget adjustments. I feel like she invested all of her energy in the design, as if it was for one of her very own cherished family members. Dressed to the nines, she didn't think twice about scaling a ladder into my attic to assess the roof joists, and she came up with solutions for landscaping to prevent water erosion, before the renovation could begin. She also personally chose the perfect contractor, as she knows that that relationship is key, in facilitating a smooth transition during the time of construction, while we remain living in the spaces. I can't say enough about how wonderful it has been to work with her over the past several months, and how much her work will impact my life, and the lives of my family, as the construction is about to begin. Thank you for your kind words Pam! 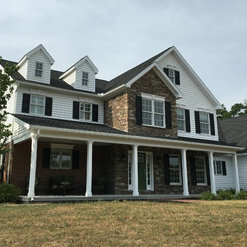 We love what we do and it is so rewarding for us to be able to provide services for customers like you who deserve a beautiful home so that you can continue to provide loving care for your family. Thank you for entrusting us with your home design--We are looking forward to seeing the progress! I approached Allison with an idea for a new home. 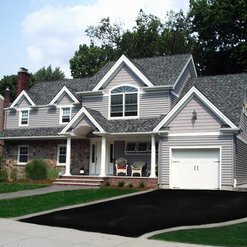 After reviewing the work of several other professionals I felt most comfortable that AOS understood the project concept. After a site visit a plan was developed with cost and material taken into consideration. Coordination with local engineering firms and suppliers ensured that the project would start on time and meet the local municipality requirements. The color plans provide a great guide for all trades involved and also as a reference for materials. The continued support and attention to the plan details are a testament to her professionalism. 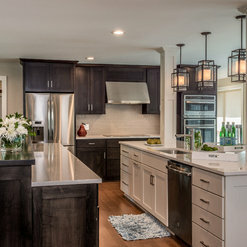 Allison was recommended to us by a local contractor after we realized our home renovation project was more complicated than the standard kitchen/bath remodel. Allison from the beginning has been nothing but wonderful to work with. She is responsive to our requests and her ability to "get inside my head" was uncanny. My husband and I are adding on and renovating a 50's brick ranch. We knew we wanted a midcentury modern feel to the home - when we got our first draft of the design I was stunned. Allison managed to figure out what I wanted without being able to actually articulate what it was I wanted. 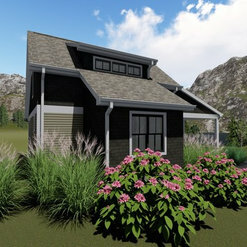 Our goal is to be in this home forever - with Allison's design we will have a home that can do that. 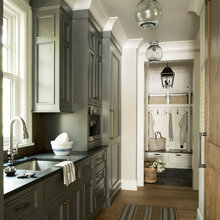 Her attention to detail is evident in her interior designs but also the exterior designs. 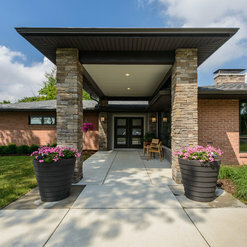 We currently have a very nondescript brick ranch - what Allison has designed for us is not only functional but beautiful, timeless, and architecturally appropriate. I would highly recommend Allison's services without reservation. She has made something that is normally stressful and made it fun and collaborative! 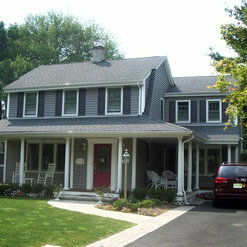 We wanted to remodel our current home to create a larger family room, remodel the kitchen, and add a full bath. We hired Allison to create some plans to meet our needs. She exceeded our expectations, and her vision allowed us to go with a plan we hadn't considered. Allison is very professional, and is very attentive to the needs of her clients. She responds quickly to our concerns. 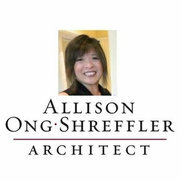 We would highly recommend Allison Ong Shreffler as an architect. Commented: Can you please share the siding information?Hello Timlberg, the siding is manufactured by Certainteed. 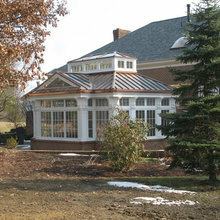 The dormer sections are shakes and the main sections of the house are double clapboard.